Ryder System, Inc. (NYSE: R), a leader in commercial fleet management, dedicated transportation, and supply chain solutions, today announced its fleet of natural gas vehicles (NGVs) has surpassed 100 million miles of operations, making it the first commercial fleet outsourcing provider to reach this significant milestone. Through this achievement, Ryder has gained substantial insight into the NGV industry and how to optimize this solution for customers looking to reduce costs and emissions. "This latest milestone reinforces Ryder's ongoing commitment to assist companies, across multiple industries reduce fuel costs, lower carbon output, and meet their environmental objectives," said Robert Sanchez, Ryder Chairman and Chief Executive Officer. "Ryder plays an important role in advancing the environmental sustainability of commercial transportation and logistics. When companies outsource their transportation and logistics operations to us, they not only get cost efficiency, but also the benefits of our environmental expertise, infrastructure, maintenance, and industry-leading partnerships." With expertly trained technicians and an extensive knowledge of natural gas and the rapidly evolving advanced fuels maintenance network, Ryder is a proven leader in this space. In addition, Ryder closely tracks emerging fleet technologies, incentive programs, and government rebates to deliver competitive lease and rental rates for customers interested in NGV solutions. By reducing emissions and fuel consumption, Ryder has the ability to positively impact consumers, the economy, and society. This innovative approach to fulfill its responsibility to the environment and the communities where its employees live and work has changed the way that Ryder, and many of its customers, do business. Beverage Container Recycler, UBCR, LLC also announced today that they would be renewing their natural gas vehicle lease with Ryder for its entire truck fleet, becoming the first Ryder customer to transition from first generation NGVs to the latest available technology. Michigan-based beverage container recycling company UBCR, LLC has operated its Ryder NGV fleet for more than 7 million miles since 2011. As an early adopter of Ryder's NGV solution, UBCR has reduced its greenhouse gas emissions by approximately 2,704 MTCO2e (metric tons of carbon dioxide equivalent) and replaced more than one million gallons of diesel fuel with lower-emission, domestically produced natural gas. Sixteen compressed natural gas vehicles, designed with the latest modifications and technological advances, will replace UBCR's entire truck fleet. "As a leading recycling company, this important carbon reduction initiative complemented our long-standing growth strategy which is grounded in sustainability. Ryder's advanced energy portfolio, expertise, and infrastructure in the market were key factors driving our decision to select them as our fleet partner five years ago, and it remains so to this present day as we continue to enjoy all the benefits of operating NGVs," said Nick Kronsbein, General Manager for UBCR. "Ryder made it easier for us to jumpstart our sustainable transportation program and convert our entire UBCR fleet to abundant, clean, and efficient natural gas. In the process, UBCR has gleaned financial benefits, including gaining more control over our costs and budgets by investing in a predictable and stable fuel source, while also contributing to the wellbeing of our environment." 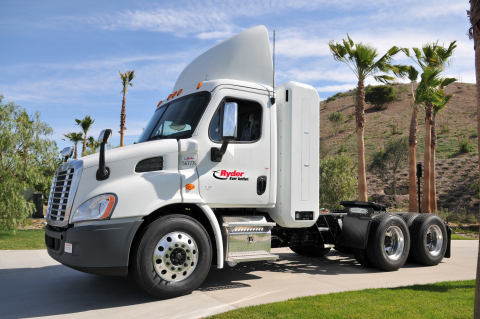 2011 - Ryder partnered with the San Bernardino Associated Governments (SANBAG) to implement the nation's most groundbreaking and innovative heavy-duty natural gas truck projects to date - purchasing and deploying more than 200 heavy-duty natural gas powered trucks. Today the Company has achieved 100 million miles with its NGV fleet operations, eliminating more than 35,269 MTCO2e of greenhouse gas emissions. Ryder has also replaced approximately 15.4 million gallons of diesel fuel with lower emission domestically produced natural gas. 2013 - Ryder's sustainability efforts expanded in 2013 when the Company opened its first natural gas fueling stations in its North American network to serve both the general public and Ryder lease and rental customers. The Liquefied to Compressed Natural Gas (LCNG) stations are located at two of Ryder's maintenance and fueling facilities in Orange, and Fontana, CA. Ryder also partnered with Clean Energy Fuels to switch the fuel at its stations in California to Clean Energy's Redeem™ renewable natural gas (RNG), the cleanest fuel available today. By making the switch to RNG, Ryder is expected to reduce greenhouse gas emissions by approximately 6,300 metric tons per year using current fuel volumes. This would be the equivalent of removing approximately 1,319 passenger cars from the road annually. 2015 - Ryder announced one of the largest investments in its advanced energy portfolio: the launch of a new online NGV maintenance training program for its entire North American maintenance network. The program provides the Company's entire technician workforce with knowledge of a wide array of NGV platforms and configurations in order to better serve customers who commit to converting all of or part of their fleets to natural gas. Ryder currently has 22 NGV maintenance facilities with more than 5,500 NGV trained maintenance and support personnel. "Ryder is making proactive investments to ensure our maintenance employees are knowledgeable and skilled in the safe operation and maintenance of NGVs," said Scott Perry, Ryder Vice President of Supply Management and Global Fuel Products. "Well-maintained vehicles of any kind are better for the environment, with reduced emissions and improved fuel consumption. Traditional shops must go through a modification process to meet stringent industry and government safety standards for NGV maintenance and technicians must receive extensive, specialized training. Ryder is now in a position to train any existing, or new, technicians on the latest NGV technologies, further demonstrating our commitment to develop the best-in-class technician workforce." Ryder's NGV fleet consists of compressed and liquefied NGVs serving customers in Arizona, Arkansas, California, Florida, Georgia, Louisiana, Maryland, Michigan, Minnesota, Mississippi, New York, Pennsylvania, Tennessee, Texas, Utah, Wisconsin and in both Ontario and Quebec, Canada. For more information about Ryder's NGV solutions visit http://www.ryder.com/en/solutions/alternative-fuels-solutions/natural-gas-solutions.aspx.